Looking for something? Try using our search functionality below or contact us for assistance. How early do I need to make my reservation? The earlier the better. However, a minimum of 24 hours is recommended for online bookings. If you are making a last minute booking it is best to contact us by phone. If you make a last minute online reservation there is no guarantee that you will be picked up, unless you receive a confirmation. Yes you can make a booking on the phone. Refer to our contact page for our phone numbers. This is often the best option if you are making a last minute booking. Can I make a reservation if the journey consists of more than eight passengers? We can provide you a service with a combination of vehicles or a bus. Please use the reservation form and ensure that you include the number of passengers and full details of your journey. How do I meet the driver? Because of new rules at the airport, we can no longer stand with nameplates at the arrival hall. You should now go to UNIT 36 of Garage de Paarl. Please provide your name when you get there; the names of the arriving passengers are listed in our unit. From here you will be guided by the relevant driver to the vehicle. 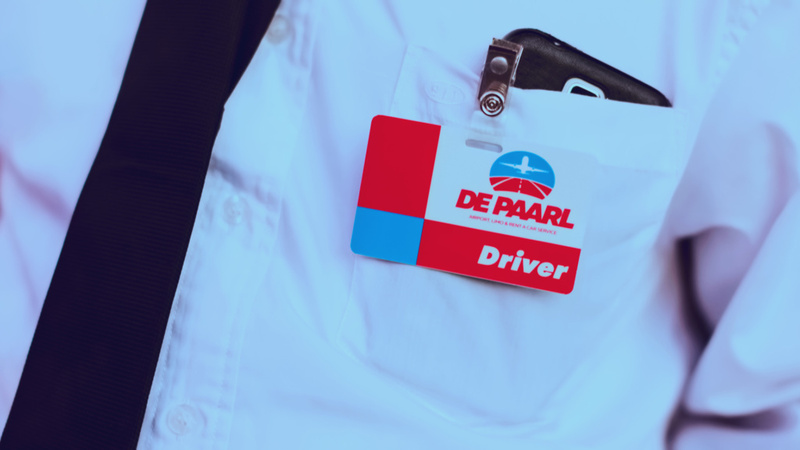 Your driver will have a red or white shirt on, and a badge with “Garage de Paarl” on it. How shall the payment be made when I arrive? The payment is made with the driver who takes you to your destination in Suriname. Through our office the amount is already passed to the driver when you’ve made a reservation online or by phone. If you have not made a reservation, you can access the rates on our website on our Airport Service page. Our drivers will be waiting for you at the airport well before your arrival time. So you won’t have to wait any second at the airport before getting into the car and being on your way to your destination. Can you guarantee that your driver will be on time to me pick me up to go to the airport? Sometimes it’s difficult to predict traffic and other situations outside of our control. However, our drivers will make every effort to arrive on time. In 99% of the time we pick up our customers on time to go the airport. We love speaking to and helping our customers! Contact us today; our repre­senta­tives will be happy to assist you. Become a part of our conversation on social media and stay updated on the latest developments. © 2019 Garage de Paarl. All rights reserved. Our reliable Airport Service ensures the safe transportation of passengers to and from the airport. Please fill out the form below to make your reservation and receive an estimate. Personal Information: My name is Mr.Mrs.Miss . I can be reached by email at , or by phone at . I'm making this reservation on account of . at 12:00 AM12:15 AM12:30 AM12:45 AM01:00 AM01:15 AM01:30 AM01:45 AM02:00 AM02:15 AM02:30 AM02:45 AM03:00 AM03:15 AM03:30 AM03:45 AM04:00 AM04:15 AM04:30 AM04:45 AM05:00 AM05:15 AM05:30 AM05:45 AM06:00 AM06:15 AM06:30 AM06:45 AM07:00 AM07:15 AM07:30 AM07:45 AM08:00 AM08:15 AM08:30 AM08:45 AM09:00 AM09:15 AM09:30 AM09:45 AM10:00 AM10:15 AM10:30 AM10:45 AM11:00 AM11:15 AM11:30 AM11:45 AM12:00 PM12:15 PM12:30 PM12:45 PM01:00 PM01:15 PM01:30 PM01:45 PM02:00 PM02:15 PM02:30 PM02:45 PM03:00 PM03:15 PM03:30 PM03:45 PM04:00 PM04:15 PM04:30 PM04:45 PM05:00 PM05:15 PM05:30 PM05:45 PM06:00 PM06:15 PM06:30 PM06:45 PM07:00 PM07:15 PM07:30 PM07:45 PM08:00 PM08:15 PM08:30 PM08:45 PM09:00 PM09:15 PM09:30 PM09:45 PM10:00 PM10:15 PM10:30 PM10:45 PM11:00 PM11:15 PM11:30 PM11:45 PM with a total of passenger(s). My destination address in Suriname is . My prefered vehicle for transportation is a Bus (as a passenger)Taxi (2 persons)Taxi Station (3 persons)Bus for 8 personsBus for 10 personsBus for 15 personsBus for 25 persons . at 12:00 AM12:15 AM12:30 AM12:45 AM01:00 AM01:15 AM01:30 AM01:45 AM02:00 AM02:15 AM02:30 AM02:45 AM03:00 AM03:15 AM03:30 AM03:45 AM04:00 AM04:15 AM04:30 AM04:45 AM05:00 AM05:15 AM05:30 AM05:45 AM06:00 AM06:15 AM06:30 AM06:45 AM07:00 AM07:15 AM07:30 AM07:45 AM08:00 AM08:15 AM08:30 AM08:45 AM09:00 AM09:15 AM09:30 AM09:45 AM10:00 AM10:15 AM10:30 AM10:45 AM11:00 AM11:15 AM11:30 AM11:45 AM12:00 PM12:15 PM12:30 PM12:45 PM01:00 PM01:15 PM01:30 PM01:45 PM02:00 PM02:15 PM02:30 PM02:45 PM03:00 PM03:15 PM03:30 PM03:45 PM04:00 PM04:15 PM04:30 PM04:45 PM05:00 PM05:15 PM05:30 PM05:45 PM06:00 PM06:15 PM06:30 PM06:45 PM07:00 PM07:15 PM07:30 PM07:45 PM08:00 PM08:15 PM08:30 PM08:45 PM09:00 PM09:15 PM09:30 PM09:45 PM10:00 PM10:15 PM10:30 PM10:45 PM11:00 PM11:15 PM11:30 PM11:45 PM . My pickup address in Suriname is . My prefered vehicle for transportation is a Bus (as a passenger)Taxi (2 persons)Taxi Station (3 persons)Bus for 8 personsBus for 10 personsBus for 15 personsBus for 25 persons . An email will be sent to you containing the information you provided to us. If you do not receive an email, make sure to check your spam folder. We typically respond within 24 hours; call us if you need immediate assistance. Reservations are only valid once you have received our confirmation. Please fill out the form below to start the reservation process and request an estimate for our Limo Rental Service. Please specify the routes that the limousine will have to travel below. at 12:00 AM12:15 AM12:30 AM12:45 AM01:00 AM01:15 AM01:30 AM01:45 AM02:00 AM02:15 AM02:30 AM02:45 AM03:00 AM03:15 AM03:30 AM03:45 AM04:00 AM04:15 AM04:30 AM04:45 AM05:00 AM05:15 AM05:30 AM05:45 AM06:00 AM06:15 AM06:30 AM06:45 AM07:00 AM07:15 AM07:30 AM07:45 AM08:00 AM08:15 AM08:30 AM08:45 AM09:00 AM09:15 AM09:30 AM09:45 AM10:00 AM10:15 AM10:30 AM10:45 AM11:00 AM11:15 AM11:30 AM11:45 AM12:00 PM12:15 PM12:30 PM12:45 PM01:00 PM01:15 PM01:30 PM01:45 PM02:00 PM02:15 PM02:30 PM02:45 PM03:00 PM03:15 PM03:30 PM03:45 PM04:00 PM04:15 PM04:30 PM04:45 PM05:00 PM05:15 PM05:30 PM05:45 PM06:00 PM06:15 PM06:30 PM06:45 PM07:00 PM07:15 PM07:30 PM07:45 PM08:00 PM08:15 PM08:30 PM08:45 PM09:00 PM09:15 PM09:30 PM09:45 PM10:00 PM10:15 PM10:30 PM10:45 PM11:00 PM11:15 PM11:30 PM11:45 PM . Please fill out the form below to make your Car Rental reservation and request an estimate.
. I can be reached by email at , or by phone at . I'm making this reservation on account of . Toyota Vitz, Toyota Ist or similar car. Toyota Corolla, Toyota Mark X, Toyota Platz or similar car. Toyota Rav 4 (2 doors) or similar car. Toyota Rav 4 (4 doors), Kia Sorento, Mitsubishi Outlander or similar car. Toyota Raum, Toyota Spacio or similar car. Toyota Regius, Nissan El Grand or similar car. Please fill out the form below to send us an email. We typically respond within 24 hours; call us if you need immediate assistance. Personal Information: My name is . I can be reached by email at . My inquiry is about Airport Service Limo Service Rent A Car Service Job Opportunities Other .